My parents gave me back an old cork bulletin board I had on my wall in my bedroom in high school. The cork was frail and I had written stuff all over the frame with a permanent marker. 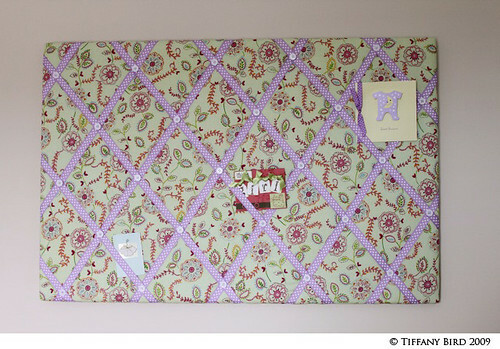 Not wanting to toss the board, I covered it with quilting padding and a cute fabric. Then I stapled ribbons crisscrossing over the front of the board. Finally, I used twisted pins for furniture to tighten the ribbons where it met and glued buttons to cover the twisted pins. A quick and simple makeover and now it is hanging in Kaye’s room. If you made something inspired by Simply Modern Mom, please upload pictures of it in our Flickr group to show it off to everyone. You may be featured on Simply Modern Mom. Very cute! What a great project! That is great I am in the process of doing one for above my daughters changing table in her room.